There are several very good reasons you might want to change the password to your Windows computer. Personally, I'd like to think you want to change your password simply because you know it's a smart thing to do every so often to keep your PC secure. Of course, another good reason to change your password is if your current password is too easy to guess...or maybe too hard to remember! Regardless of the reason, changing your password is very easy, no matter which version of Windows you have. You can change your password in Microsoft Windows via the User Accounts applet in Control Panel. However, the steps involved to change your password differ somewhat depending on which operating system you're using, so be sure to take note of those differences when they're called out below. Using the search bar, type sign in options and then choose Sign-in options from the list of results. If that doesn't work, open Control Panel, choose User Accounts (Windows 10) or User Accounts and Family Safety (Windows 8), then the User Accounts link, followed by the Make changes to my account in PC Settings, and finally Sign-in options on the left. Under the Password section, click or tap Change. Enter your current password in the first text box and then click Next. For Windows 10 users, enter your new password twice to verify that you've typed it correctly. You can optionally type a password hint, too, which will help remind you of your password should you forget it when logging in. For Windows 8 users, enter your current password once more on the Change your Microsoft account password screen, and then type your new password twice in the provided text boxes. Click Finish to exit the Change your password or You changed your password screen. You can now exit any other open Settings, PC settings, and Control Panel windows. Click on Start and then​ Control Panel. If you're using Windows XP (or some versions of Windows Vista), this link is instead called User Accounts. If you're viewing the Large icons, Small icons, or Classic view of Control Panel, you won't see this link. Simply click on the User Accounts icon and proceed to Step 4. In the Make changes to your user account area of the User Accounts window, click the Change your password link. For Windows XP users, look instead for the or pick an account to change section, and click your user account, and then click Change my password on the following screen. In the first text box, enter your current password. In the next two text boxes, enter the password you would like to start using. In the final text box, you're asked to enter a password hint. This step is optional but I highly recommend that you use it. If you try logging in to Windows but enter the wrong password, this hint will display, which hopefully will jog your memory. Click on the Change password button to confirm your changes. You can now close the User Accounts window and any other Control Panel windows. Now that your Windows password has been changed, you must use your new password to log in to Windows from this point forward. Trying to change your password in Windows (because you forgot it) but can't get in to Windows (again, because you forgot your password)? 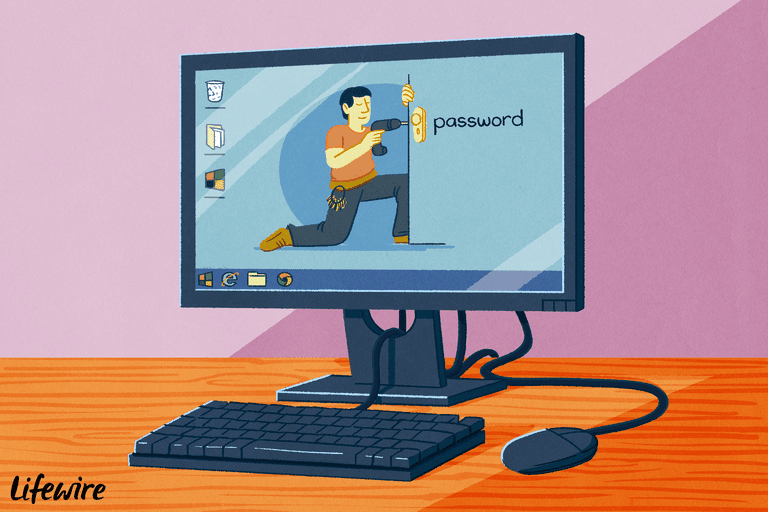 Most people use a Windows password recovery program to crack or reset the password but you should also see our complete list of ways to find lost passwords in Windows for some other options as well. Another option is to create a Windows password reset disk. While not a required part of changing your password, I highly recommend that you do this. You do not need to create a new password reset disk if you already have one. Your previously created password reset disk will work no matter how many times you change your Windows password.